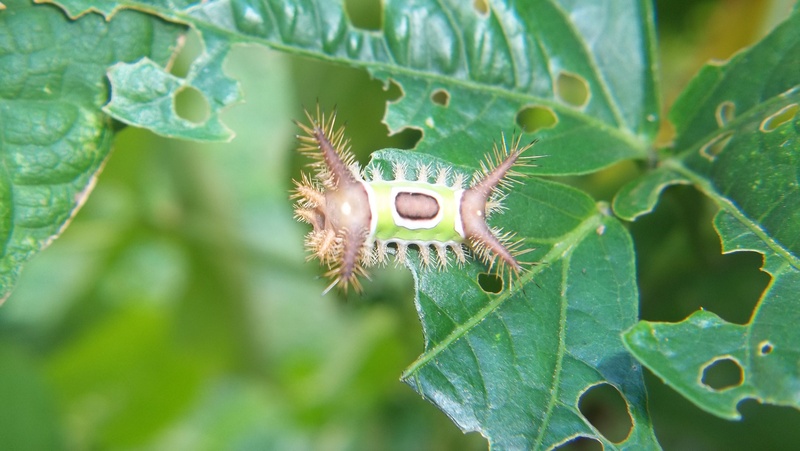 Saddle back caterpillar. Never saw anything like it before in these 60 years of being outside doing things. So I won’t die or lose a limb or anything, but it will hurt for a while. You can Google him for more info. I’d say watch out for them but this is my first one in all these years so what are the chances of another one? One article I read says you would find them on deciduous trees, and sometimes on corn. Does this green bean plant look like a tree? No, it looks like a Japanese beetle-eaten green bean plant. Guess I’ll wear gloves to pick beans from now on. My finger hurts. Nasty is one word, but I could choose others…….ugly in looks and reputation both! Great capture! That caterpillar looks very strange for a caterpillar! Those spikes look beyond nasty. Should you maybe have your finger looked at? Thanks. Nah, I read a couple articles on line once I found out what it was. It should just hurt for a few hours then go away. Like sticking the finger in fire for the first hour. Nasty little bugger for sure. The articles said every little hair has a poison sac and all you have to do is brush it. It’s settling down now Jackie, thanks. Nature is amazing. Some of the bugs you’ve photographed were more beautiful than I knew bugs could be. This one is actually quite interesting looking, if you don’t get your fingers against him. You too! Take some more good pictures for us to see. Thanks. It was all very unusual! It’s all ok this morning; stopped hurting after 3 or so hours last night. Do you mind me asking what part of the country you live in? I’m curious if this fellow is unique to your area or do I need to be on the lookout here in NE TN??? Yea, really good pictures in that article too. I see from colors that this one here is a younger one, not dark yet. And since I saw the picture of the moth they turn into, I know now that I had seen one of those on the back of the house several years ago, and even took a picture of it then, cos it was so ugly. I have this one in a plastic container on the back porch to watch and see what happens, but he will not be allowed to breed if he spins and turns into a moth, noooo. That’s one set of eggs I can avoid. I seldom kill anything, but this guy’s gotta go! Looks like a bacteria in a biology book….I have never seen a caterpillar like that before!! Neither had I and hope to never see any more. Thanks for checking out my blog. I hadn’t either, and sure hope never to see or feel another one!